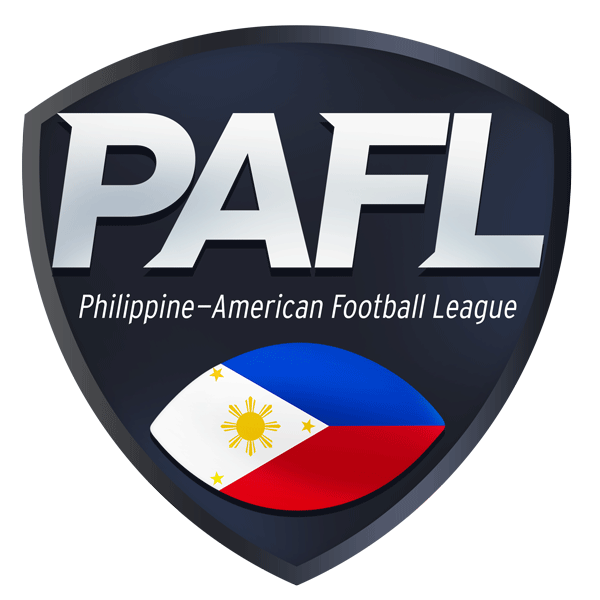 Going into week 4 of PAFL season 3, the Rebels look to bounce back from their defeat at the hands of the defending champions the Wolves. 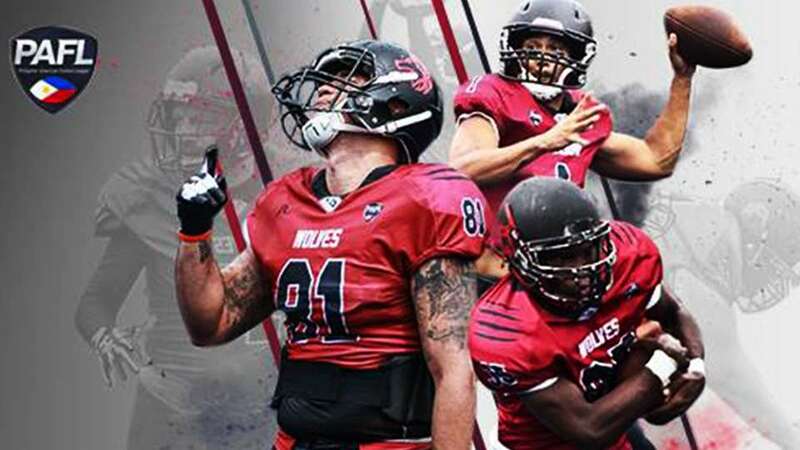 After 2 bye weeks with this being their 2nd game, the Rebels looked keen to prove themselves as one of the perennial contenders for this year’s crown. 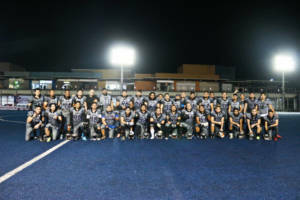 Being the newest team in the league didn’t seem to faze them one bit as they’ve already garnered playing experience at the last international game in April where they took on a tough Saipan team. Known for their toughness on the field, they take on a high spirited Cavemen team who are looking to increase their win column to 3 straight as they defeated the Warriors on week 3. The Cavemen started off at kick return looking to get the ball after the Rebels’ kick off in order to run offensive plays at the onset of the 1st quarter. 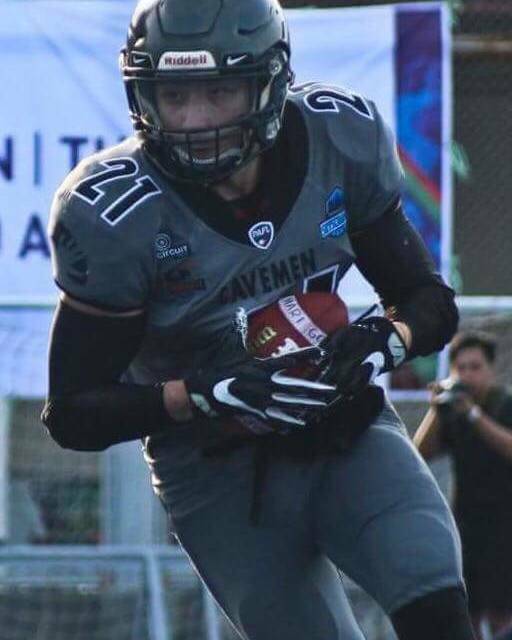 They didn’t disappoint as Nikko “2.0” Garcia struck hard and fast scoring a touchdown in the first minute of play running the ball almost the entire length of the field to score the first 6 points for the Cavemen. From there, the Cavemen offense looked to be firing on all cylinders as they scored almost at will as star QB Mike “Sunshine” Hoese orchestrated a masterful charge down the Rebels’ end zone. Looking to dominate the field of play, the Cavemen started executing run plays left and right as is their bread and butter in regard to their most potent offensive weapons. Running back Karel Coldenhoff seemed to be untouchable as he weaved through the Rebels’ defense with as much tenacity as a conquering army would; thus earning him his new nickname “The Conqueror”. He would go on to score a total of 4 touchdowns and 1 two point conversion backed up by more than 150 rushing yards during the game which would subsequently secure him -Player of the Game-honors. The Cavemen offense didn’t let up one bit during the first half as they then looked to mix things up quite nicely en route to 44 points by halftime. 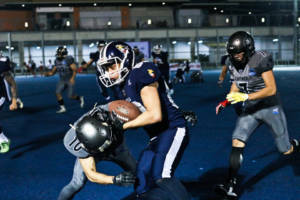 Team Captain Will Yeh would score a rushing touchdown while Nikko Garcia would then score another two point conversion, both coming from run plays. Pereme “The Dream” Alina also got into the mix as he caught a touchdown pass midway into the 2nd quarter. 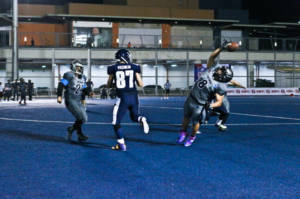 Staying true to the tune of mixing it up, veteran lineman and tight end Eric “Pancakes” Ong caught a reception as well as a two point conversion from Sunshine. The Cavemen would go into halftime up 44-0. If the first half was dominated by the Cavemen offense, the 2nd half was all about the stifling defense the grey and black squad is known for. 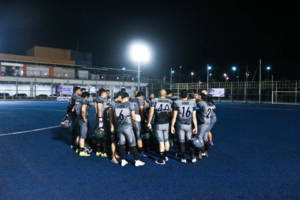 Despite getting the ball to start the 3rd quarter, the Rebels had a tough time bringing the ball downfield though they managed to get several first downs due to a brilliant kick return by the quick feet of Duanne Barsabal who managed to garner over 80 yards rushing throughout the night. 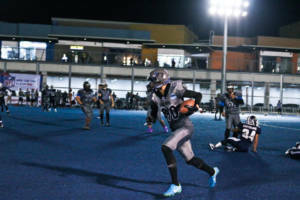 As the Rebels crossed midfield nearing the Cavemen redzone care of weaving run plays from running back Jec Castolome, they looked poised to avoid a shutout for the night. But subsequent stops care of the Cavemen defensive line and several offensive penalties on the Rebels saw them bring the ball back as they needed to punt. 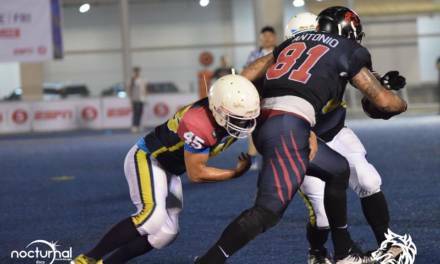 From there, the Cavemen offense went into full swing again as Maximo “Ultimo Avenger” Carlos went all beast-mode and scored on the punt return zig zagging his way through several tackles to increase the Cavemen’s lead. Wide receiver CJ Ocampo would later add to that in lieu of a 2 point conversion immediately after. This seemed only to hype up the Cavemen defense as they were fully determined to keep the Rebels from scoring on them. 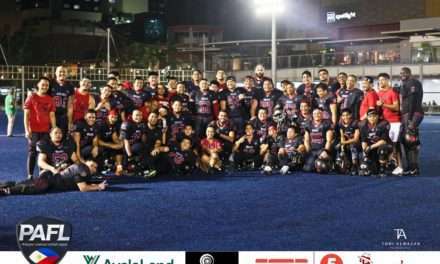 Backed up by brilliant tackles from Aaron “8-Ball” Valencia, Matt “Heartbreaker” Mallorca, Eric “The Anvil” Tuason, and Vic “The Body” De Guia, they brought the Rebels back into their own endzone whereafter, a broken offensive play was turned into a safety care of linebacker Mikey Reyes. As the Cavemen got the ball back by the end of the 3rd quarter, they increased their lead even more as Nikko Garcia caught a touchdown from RJ Laurel who would take over quarterback duties from Sunshine. Several plays later, RJ would then lead the Cavemen downfield and into the endzone as he ran in for a touchdown and would again rush in for a 2 point conversion quickly after. 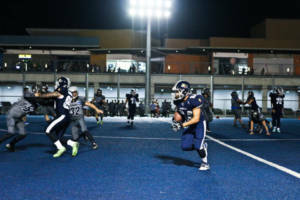 These subsequent energetic plays would earn him the new moniker “The Energizer”, reminiscent of retired NFL QB Michael Vick and his style of running the ball. 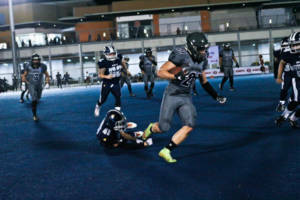 As the game seemed sealed for another win by the Cavemen, they looked to end the night with a bang which was delivered quite literally through spectacular defensive plays by linebacker and special teams standout Marty Sager. 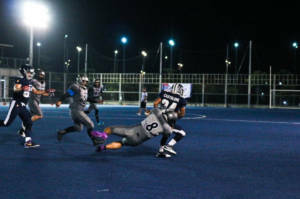 Making several tackles and blocks that reverberated through the field , the entire Cavemen lineup was in awe as his hits could be heard all the way down the gridiron. This led his teammates to coin him Marty “The Machine Gunner” Sager as his selfless and hard hitting mentality highlighted what would be the Cavemen’s biggest win to date. 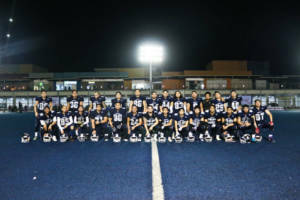 As the final whistle sounded, the score spoke for itself as the Cavemen won 72-0 over the Rebels who fought bravely and with tenacity that could only come from a team with a ton of heart. CATCH THE CAVEMEN as they look to take on the hard-hitting Datus on October 13, 2018 at the Blue Pitch! !